Drugi już tom mangi Yu-Gi-Oh skierowany w stronę młodszych graczy, ale sama znajdująca się tam karta nie wygląda na przyjazną! (1) You cannot Pendulum Summon monsters, except Dragon monsters. This effect cannot be negated. (2) Target 1 Dragon Fusion, Synchro or Xyz Monster in your Graveyard; destroy this card, and if you do, Special Summon that monster. Cannot be Normal Summoned/Set. 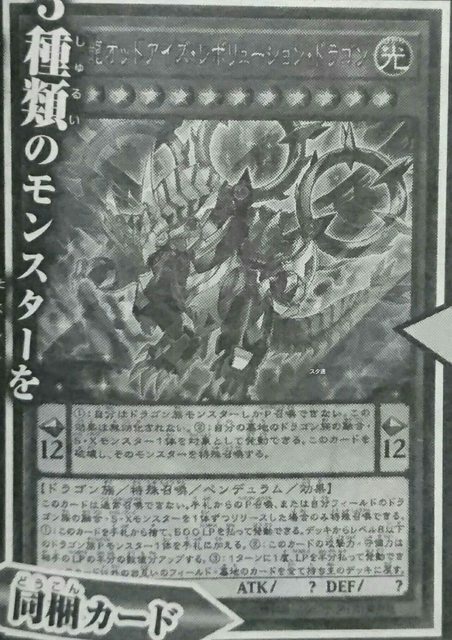 Can only be Special Summoned by Pendulum Summoning it from your hand OR Tributing 1 Dragon Fusion Synchro and Xyz Monster (each) to Special Summon this card (from your hand). (1) You can discard this card from your hand, then pay 500 LP; add 1 Level 8 or lower Dragon Pendulum Monster from your Deck to your hand. (2) This card gains ATK and DEF equal to half your opponent’s LP. (3) Once per turn: You can pay half your LP; return all cards on the field and in the GY, except this card, to the Decks. [OCG][YS01] Yu-Gi-Oh! ARC-V The Strongest Duelist Yuya! !